So…thankfully I had planned on being here for the festival anyway. 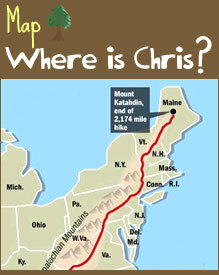 I ended up 30 miles short of my goal this week when Jason, producer for the “Road Less Traveled” tv show, picked me up. Hopefully it heals soon! 5/7 17.3 miles, didn’t rain, yet the trail was mostly a river today as it continued to rain hard last night. Saw cows and ponies today. I like the change of walking through fields. 5/8 20 miles, rained all morning, then the sun came out. Most parts of the trail were still a stream. 5/9 22.2 miles, staying at a cheap motel tonight so I can resupply. Woke up to lightning and hail last night. 5/10 14 miles, got a ride this AM to church, then a ride from church to groceries, then back to the trail! 5/11 19 miles, rained all morning, foggy cold afternoon. Patches of blue sky and sun towards the end. 5/12 23.8 miles, pain all day. Nice sunny day, though. 5/13 6.5 miles, couldn’t walk any farther, leg hurts too bad. 5/14 0 miles, waiting for Jason to pick me up from Trent’s grocery. Overheard fantastic talk of a hay bale falling off someone’s trailer and crashing through an angry neighbor’s fence. 5/15 0 miles, back in Damascus, resting…. hey chris! i’m lame…i FINALLY joined your fb group yesterday and am SO glad i did! i want to let you know that i think you are absolutely amazing for embarking on this journey and can’t wait to hear how it continues to unfold…god’s blessings and travelling mercies, my friend! Chris!!! This is great. Your website is so much fun. haha, you are a dork. but we love you anyway! thanks or the tour of your pack! very exciting! i was expecting a little facilitating though did scioto teach you nothing? we are praying for you!!! hope your pain goes away soon! Yowch, glad it wasn’t too serious. Great tour of all the gear, really informative and fun to see what you’re lugging around. The feed bag makes total sense. I bet it will be the new trend. Feel better man. I’ll pray that you stumble upon some magic poison ivy that makes your leg twice what it formerly was! You’ll be done with with trail in no time! I have absolutely nothing of import to say. Just wanted you to know that I’m still following your travels and your blogging. Hope your leg heals quickly and painlessly. Ta-Ta, my dear! Nice product endorsements…I hope you get a sponsor soon. I pray you heal quick. Lo siento mucho que tienes un tobillo malo. Zut alors! Me encantó el video!!! Estabamos muy cerca para unos minutos.Ja. Pienso que las compañías de los productos necesitan darte un sueldo (salary). Cuidate mucho! Te adoro! Tu prima, Jamie, está embarazada!!!!!!!!!!!!!! you have very stong hands. thank you for the wonderful pack-tour and for gently rotating each item of clothing. epic, really. other than that, stay strong. “owies” are different from “injuries.” hope its an an “owie”….get better! i flew over you today…in an airplane. maybe you saw me. i was the one cheering in the window saying “yes you can!” (its worked for people in the past). Joint supplements, eh? Pick those up in Boulder? Hope your leg is feeling better! Anyone bought that tent yet? My wife and I have been looking at that same one – we were actually hoping to find a slightly used one…how much do you want? Really loved the tour–especially was glad to hear you brush your teeth and wear underwear. The water purifying process looks a little primitive. Are you sure it’s safe? I’m so sorry to hear about your leg. Make sure you take it easy once you get back on the trail or it will happen again. Only 1600 more to go. You’re doing great. Until next report, I will be praying for your leg to heal. You are such a rockstar. Nice thinking on cutting your crocks. I think I saw that on survivor man.